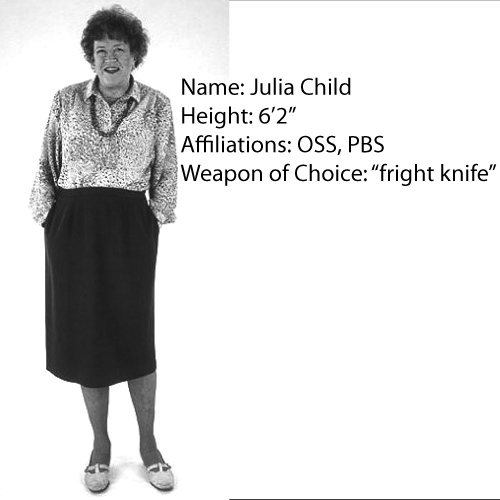 Julia Child worked for the Office of Strategic Services. That’s not new information; the New York Times mentioned it in 1994 when her husband’s obituary. The 2002 NPR story, The Lady Was a Spy, talked about Child’s role in developing a shark repelent coating for underwater explosives! The Schlesinger Library at Radcliffe has Julia Child’s Papers, which include several documents on her time at OSS. Unfortunately, the library has very little of that collection online, but the Julia Child Papers finding aid is fascinating. Just yesterday, Aug 13, an AP story came out about the opening of OSS personnel records at the National Archives; like the NARA press release issued the week before, the AP story emphasized famous OSS personnel including Julia Child. I had no idea Julia Child was employed by the precursor to the CIA, and it really struck a chord with me. Here’s a screenshot of the NARA record for OSS employee Julia Child, née McWilliams. I’ve requested a copy of the file from the National Archives…can’t wait to get it. This Google Trends Graph shows that the idea of the celebrity chef spy resonated with a lot of other people too. The graph shows peaks of searches about Julia Child last night, when the AP story came out, and today, when everyone else read the emails their friends sent them about it. Kudos to the NARA PR people for getting so many people to read a story that’s basically about archives and government documents. If you can’t stand the heat…..DIE! Ah, the world’s a fine place. Well, since l can’t get to Boston or College Park right now, I think i’ll pay another visit to the Smithsonian’s wonderful online exhibit on Julia Child and the companion site about working with the grande dame to create the exhibit. This entry was posted in archives on August 14, 2008 by Jason. How about: “Adventures of a Child Spy”? Oh man, Quantum of Butter!!! That is soooo good. I love it. America by Food. Local museums. the Smithsonian’s traveling exhibit. Zeitgeist.